There's nothing wrong with a bit of baggy. And certainly there's little or nothing 19th century without that touch of cellulite. And that's mostly where all the masterpieces live. No waste. But no bounty either. 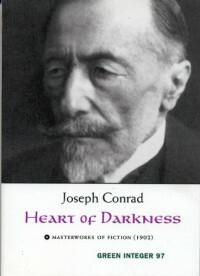 Conrad's prose is too parsimonious for anything to get very close to masterpiece status. I like him fine but he was a writer who tied his boots too tight almost on purpose. He wrote better about the sea than anything else and yet did relatively little of it. You're right (in a tiny, limited sense) in that the strangely neglected “The Secret Agent” is probably his best - full of surprises and real pleasures - does “Greenwich” like no one ever did.